Win the hearts of your close ones by sending this Ultimate 5 Christmas Delight Hamper and mesmerise them by your sweet gesture. 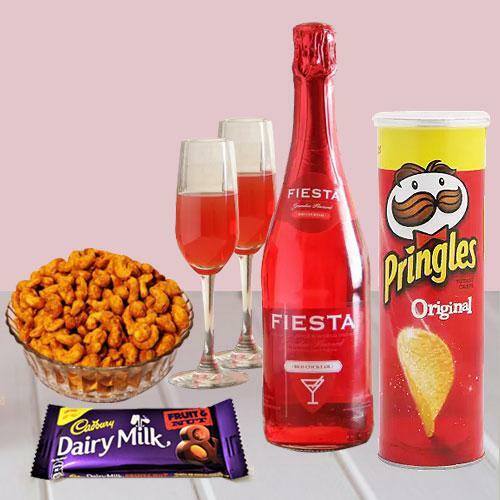 This alluring Hamper contains Masala Cashew Nuts (100 gm), 1 Pringle Chips, 1 Cadbury Dairy Milk Fruit N Nut, 1 Bottle of Sparkling Fiesta Fruit Juice (275 ml) along with 2 complementary Wine Glasses. Delivery Time: 2-3 Working Days Depending on Locations.